Shopping for Blaze and the Monster Machines Construction Toys? 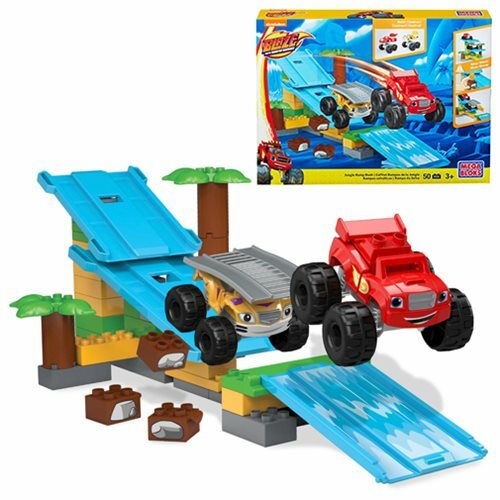 Get set for a wild ride when your little one builds a balancing act with the Monster Machines in the Mega Bloks Blaze Jungle Ramp Rush. Blaze is in the jungle, visiting his friend Stripes, just like in the show. Build Blaze and Stripes, and use the blocks and special parts to create a jungle, complete with palm trees and platforms you can build three levels high. Then, set Blaze and Stripes on their marks on the platforms above and below, adding the special ramp piece to Stripes back. Learn all about mass when you add the weights to the middle ramp, launching Blaze over Stripes back, down the levels, and through the waterfall for an action-packed jungle stunt! Contains 50 pieces. Ages 3 and up.